The latest decorated stone from the Ness. Now we’ll tell you all about it. Last week, digging in the area of Structure Eight, and possibly in Structure Seventeen which underlies it, Georgie found herself uncovering one of the most remarkable decorated stones we have ever seen. It has deeply incised banded decoration consisting of a series of carved parallel lines, infilled with decoration including lattice and saltire-like patterns. Antonia and Georgie finally remove the stone after several days of careful preparation. 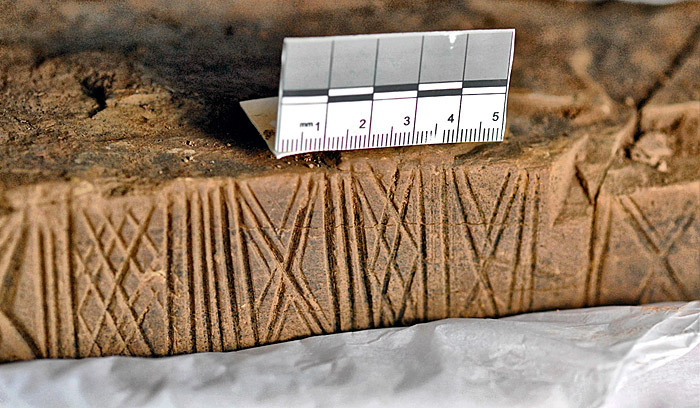 There are also very fine incised lines and Antonia, who is nearing the end of her PhD on decorated stone here and throughout Orkney, says that these may have been “guidelines” which were then incised over more deeply. Some of them, however, have not been used, perhaps giving indications of an earlier plan for the stone. The new stone is also early in the history of the site, says Antonia. A close-up of some of the finely incised designs. 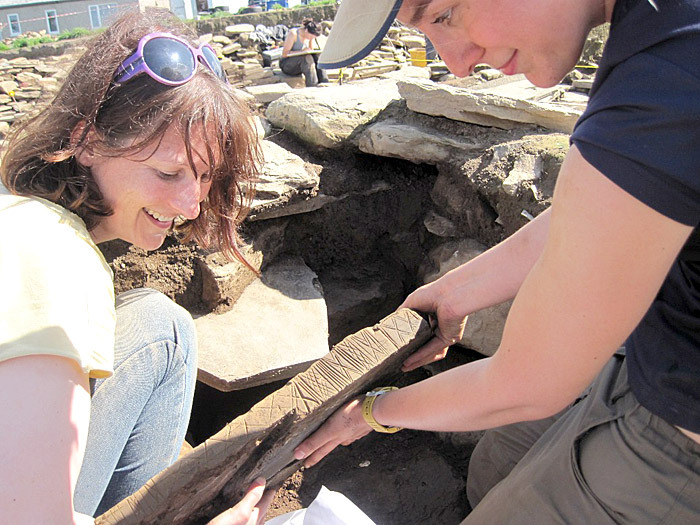 Georgie and Antonia had to partially dismantle a section of the surrounding wall to remove the decorated stone. Even dig director Nick got his hands dirty with the removal of the stone. It is strikingly similar to the incised stone removed from the north-east corner of Structure Eight, in 1925, and is now in the National Museum in Edinburgh (this new stone will stay in Orkney). It is also similar, although far superior, to another stone from Structure Eight, found in 2009, which can currently be seen in the Stromness Museum and, indeed, illustrated on its leaflets. 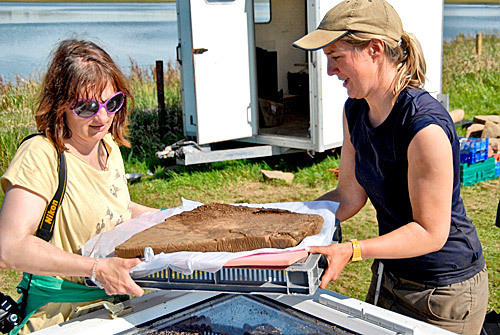 Antonia and Georgie remove the stone to a secret, high-security location. 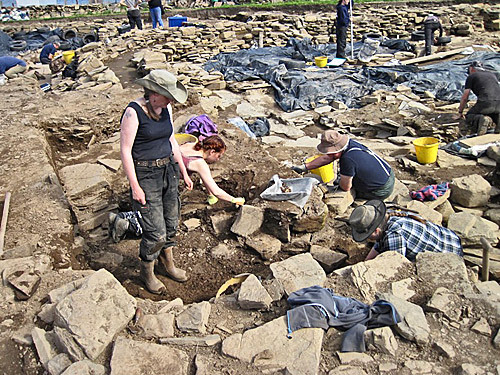 One of the many intriguing elements in this discovery is that the stone may have been hidden, at least in one period of its life, within the wall of the structure. This is a recurring theme and it raises the daunting prospect that the walls of the Ness structures may hide many more astonishing examples of decorated stone. Where does this stone rank in our Top Ten? Well, as site director Nick says, it is certainly one of the very top five discovered thus far and, remember, we already have more than 700 decorated stones. As for Georgie, she will have to try very hard if she wants to beat this discovery in the rest of her archaeological career. In Structure Twelve, some large blocks of stone were lifted out this afternoon. They were lying embedded in the floor, but the angle and position in which they lay suggests, strongly, that they came from the top of the central west pier and may have been pushed over. Estimating the size of these stones, and following on from earlier discussions, it seems likely that the piers may originally have been some two metres high. 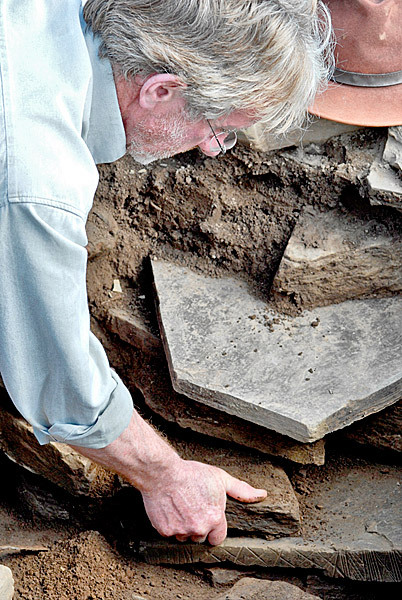 More dressed stone is revealed in the robber cut of the south-west corner of Structure Ten. In the backfill of the robber trench to the south-west of Structure Ten more handsome, dressed sandstone blocks are appearing. Some may be in their original position and, again, may have been hidden from view. Others may be associated with a Phase Two re-jig of the building. Whatever emerges from that problem, it now seems that some of the stones were being extracted to be used elsewhere but that some were then dumped back in. To say this is puzzling is an understatement and it also raises, once more, the question of what the stones were being extracted for. So many have been removed that we are left wondering where is this magnificent, large structure built from Ness stone. The weather forecast for tomorrow is horrendous and we expect the site to be closed, largely because wet, slippy conditions are very dangerous for diggers. So, we will see you on Wednesday.